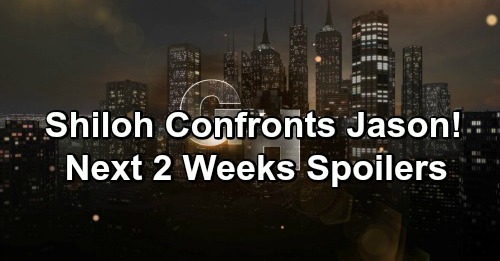 General Hospital (GH) spoilers for the next two weeks tease that some fierce faceoffs are on the way. During the week of April 15-19, Jason Morgan (Steve Burton) will have another showdown with Shiloh Archer (Coby Ryan McLaughlin). After Shiloh catches Brad Cooper (Parry Shen) with the cup from DoD’s attic, he’ll realize Jason probably played a role in getting it in Brad’s hands. Shiloh will assume Jason stole the cup when he kidnapped Kristina Corinthos-Davis (Lexi Ainsworth), so he’ll call him out on it. Jason probably won’t admit to anything, but he’ll undoubtedly make it clear that Kristina’s better off wherever she may be. He’ll hope Kristina can break free from Dawn of Day once and for all. As for Molly Lansing-Davis (Haley Pullos), she’ll worry that Kristina has gone missing. Molly will wonder when they should get the cops involved, so someone may have to fill her in on the real story. Over with Ava Jerome (Maura West), she’ll seek out Scott Baldwin (Kin Shriner) for a favor. Ava may want Scott to be her pretend boyfriend so can lure Ryan Chamberlain (Jon Lindstrom) out of hiding. Unfortunately, Ava will face a harsh rejection. Perhaps Scott will think that’s insane and could end up getting Ava murdered. It sounds like Ava will either have to keep pressuring Scott or try a new tactic. Meanwhile, Oscar Nero (Garren Stitt) will get ready to head over to the Quartermaine mansion. That’s where he’ll be spending his final weeks, so Olivia Quartermaine (Lisa LoCiero) will get everything set up. During the week of April 22-26, Jordan Ashford (Briana Nicole Henry) will face T.J.’s (Tajh Bellow) complaints. He’ll probably realize she’s in far more pain than she’s letting on. Jordan’s health is fading fast, so let’s hope a kidney becomes available for her soon. Other General Hospital spoilers say Cameron Webber (William Lipton) will get berated by Josslyn Jacks (Eden McCoy). She’ll probably just need someone to be angry at since she’ll be struggling over Oscar’s death. Later, Oscar will have a special request. He’ll summon Cam to ask him to do something for him, so this probably involves looking after Joss once he’s gone. GH fans will also see Julian Jerome (William deVry) battle some suspicions. He may sense that Ava’s up to something and warn her to stop, but Ava will keep at it. She won’t allow Ryan to show up and blindside her. Over with Nina Reeves (Michelle Stafford), she’ll face a real shocker. It may be a bit early for the fake daughter reveal, but Nina might get a step closer. Over with Curtis Ashford (Donnell Turner), he’ll plan his Canada trip and hope he can score some new evidence. Ryan’s going down if Curtis has anything to say about it! Curtis will just have to stay out of Ava’s way. She’ll object to how he handles something soon, but she can always tackle it herself. General Hospital spoilers say Kristina will cause some drama as well. Alexis Davis (Nancy Lee Grahn) will get careless and ultimately distraught, so she may let Kristina give her the slip at the safehouse. We’ll give you updates as other GH news emerges. Stick with the ABC soap and don’t forget to check CDL often for the latest General Hospital spoilers, updates and news.